Amb-designate of Uganda to the DRC, James Mbahimba presented his credentials to President Jospeh Kabila of the Democratic Republic of the Congo on Saturday September 2nd 2017 at State House, Kinshasa. Amb. Mbahimba was accompanied by his spouse Mrs. Catherinne Mbahimba and the Mission's Minister Counselor Brig. Gen. Julius Chihandae. Amb. Mbahimba passed on warm greetings from president Yoweri Museveni, President Kabila emphasizing that he would ensure that relations between Uganda and the DRC were strengthened even more. H.E. 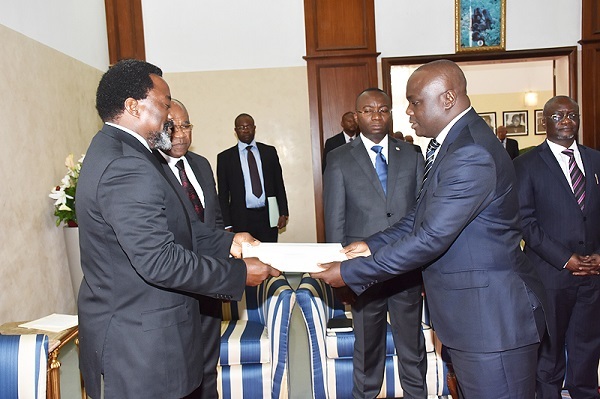 President Kabila expressed his pleasure at the arrival of the new Ambassador. He informed him that he wished to pursue the management of shared natural resources, observing that both Uganda and the DRC needed to enhance implementation of the already adopted agreement. President Kabila observed that Uganda and the DRC are brothers who must depend on one other. He appreciated Uganda's proposal of extending electric power to Beni.